Laos is a hidden gem, overlooked by its tourist-flocked neighbors - Thailand and Vietnam. The country is not as developed or tourist-friendly as many other Southeast Asian countries but it still offers an array of attractions and beautiful landscapes to keep your attention. Whether you're traveling only to Laos for a short holiday or passing by from Thailand, Cambodia, or Vietnam, here's a week and a half itinerary of the best places to visit and things to do. Let a comment if this was helpful and/or if you've been to Laos! A UNESCO Heritage-listed city and one of Laos' most popular destinations, Luang Prabang is the poster child of Laos and offers a vast contrast to the countryside and busy city of Vientiane, the capital. 1. 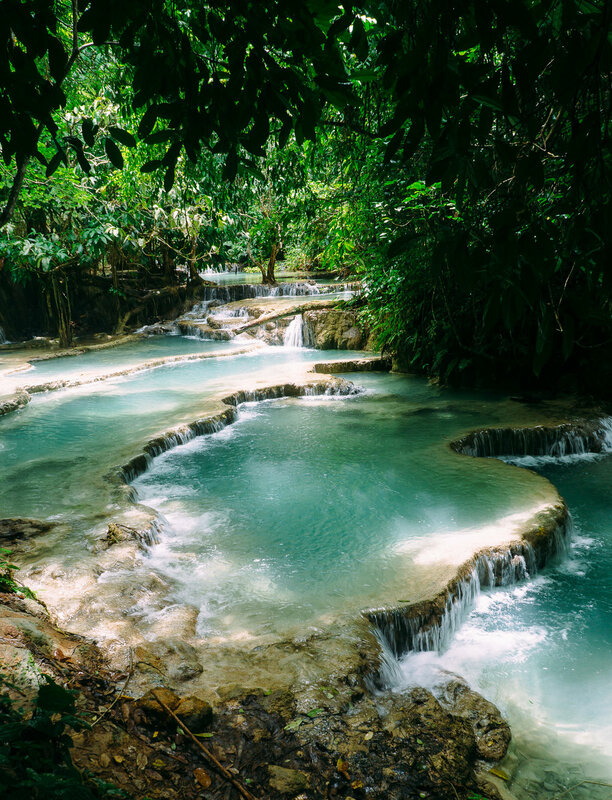 Kuang Si Falls: This is the top attraction in Luang Prabang and a good reason for it. This multi-tiered waterfall offers many swimming spots in its clear turquoise water and picturesque sceneries to make everyone at home jealous. It's a bit far out of the town so you can either hire a tuk tuk, book a tour, or rent a motorbike to get there. I would recommend going early in the morning to beat the tour groups so you can have the place to yourself. There is a bear sanctuary right before, so make sure you stop by and say hi to the lazily friendly large animal. 2. Buddhist Alms Giving Ceremony: Every morning at 5:30am monks walk around the town in silence, meditating, and giving blessings to devotees as they collect their daily alms, or food. Make sure you are up on time because within about 20 minutes, the ritual will be over. Please be respectful to the monks and devotees. You are allowed to record and take pictures but be mindful of their space and don't treat it as a tourist attraction. 3. Mount Phousi: Less of a mountain and more a hill, you can climb up to the very top in about 15 minutes to get a beautiful panorama of the city, with the Mekong running alongside. This is a very popular sunset spot so head here about 45 minutes before the sunsets so that you can find a good spot to watch the sky change colors. 4. Night Market: This market takes place every night in the main area of the town. Though it's not as big as night markets in other Asian cities (e.g., Chiang Mai, Siem Reap), it's still worth checking out one night. There are stalls of food and drinks alongside tons of clothes and other souvenirs you can bargain to bring home. You'll find homemade bags, t-shirts with funny sayings on them, jewelry, alcohol, and many other things that would remind of your time in Asia. 5. Morning Market: Unlike the Night Market, the Morning Market is not as touristy. It's most of a produce and food market selling vegetables, fish, meat, spices, etc. You'll find a lot of locals here because this is where they shop for their food. It's not as glamorous as the night market but it offers a more genuine experience. The market starts early in the day and ends around mid-morning area the Royal Palace.